I can’t believe this year is already over. It seems like yesterday we were planning the events of 2015, which began with a visit from our friend Adam Nixon, from Italy, for our church’s Bible conference. 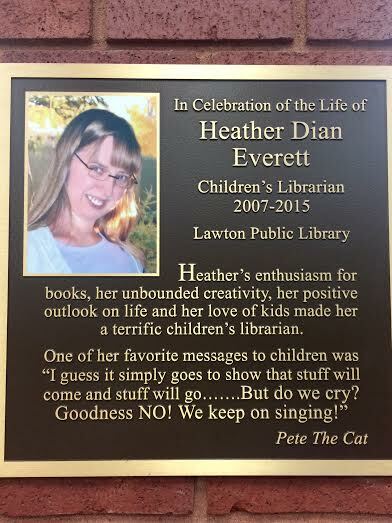 Memorial plaque for “Miss Heather” at our library. It’s been a difficult year in some ways. In May, we lost our amazing children’s librarian, Heather Everett, to cancer. That was only the beginning of death for the year. A friend of our family died in July. My first best friend died in October. I’m not up for debate cause I know what I believe but my heart hurts because someone that I looked up to when I was younger has gone so far off. It just breaks my heart. I will pray for you and your children. I don’t know if it would show up on your blog and frankly I don’t care if it does, this is the only way I knew to communicate with you so here’s my bit. Valerie, I’m just shocked. When studying up on this, your readings would have been by authors that were obviously biased on the subject, as Bumper [my husband’s nickname] would have directed you in that way, anyway, what it all boils down to is..what does the Bible say, not the teachings of man. In A beka or other material I learned from, Calvin we [sic] never painted to be a heretic, or Martin Luther..etc, but I’m not a Lutheran either, I’m a Christian, MY sins were paid for by the Blood Of Christ as well as all humankind. That includes Jews and atheists and satanists and Catholics and Calvinists…and the list goes on. I know this not because of the Sunday school lessons I was taught, or what my parents believe, but because it’s in the Word of God. Not to be added to or taken away from. There is a huge difference between foreknowledge and predestination. Your dad, and mine would be hugely disappointed, but you may never know, if you truly believe what you say, there is a chance according to you and/or Bumper they may not have been in the elect and if you are in that predestined group, and I’ve never met a Calvinist who wasn’t, you may not see them again. But I know “the Father of mercies and the God of all comfort” (2 Corinthians 1:3). We Love y’all, and God Bless..or Que Sera Sera. There wouldn’t be time or space to include all of the comments. One woman said, “Calvinists think they are so special to have God’s salvation, like they are so unworthy. Makes me sick.” Of course, I wanted to ask this lady, “So, you ARE worthy of salvation? Isn’t that pride? Doesn’t pride made God sick? (Proverbs 16:17-19)” Another person said, “So what did you do, Valerie, to be special enough to be chosen?” Answer: Obviously, nothing. That’s the point. Other conversations devolved into my being called an “idiot” and the like. Very mature responses, wouldn’t you say? In the days following my blog posts, I heard several sermons via the internet against Calvinism by friends and family. The irony is that every American historical Baptist was a Calvinist. Your American Baptist church, and mine, wouldn’t exist if it weren’t for a few brave Calvinists who landed on Plymouth hundreds of years ago. Calvinism is actually the “old path” for Baptists. Decisional regeneration is the “new” thing. But go ahead and hate Calvinism. Forget the gratitude you owe our ancient Baptist forefathers. The very reason you have freedom of religion was because of a Calvinist. Ever hear of John Leland? Yep, Calvinist. Thankfully, he is in Heaven so he can’t receive e-mail. Well, I was supposed to visit some of these people at my home church at Thanksgiving. I’m a high-strung person under the best of circumstances, so you can imagine that I was nervous about seeing them. However, at the last moment, my husband received an unsolicited invitation to preach at a sovereign grace Baptist church in my hometown. The Good Shepherd was protecting me. While most responses were negative, several people did write to say that my posts have encouraged them to study their Bibles more than ever. And that makes it all worth it. Christians need to be students of the Word of God, not of the word of man. While Calvinism was the most-viewed topic of the year, I did write about other things. I wrote three series this year: Verses I Love in February, A March Through Proverbs in the month of March, and Theological Term of the Week, which is currently ongoing. In July, my church’s printing ministry, The Watchman Press, printed a Bible study I wrote in 2009 called 31 Days of Proverbs 31. It is now available in Kindle and in print. The cost is $.99 for the Kindle version and $3.00 (plus shipping) for the printed format. I have read 46 books this year, and my goal was to read 40. 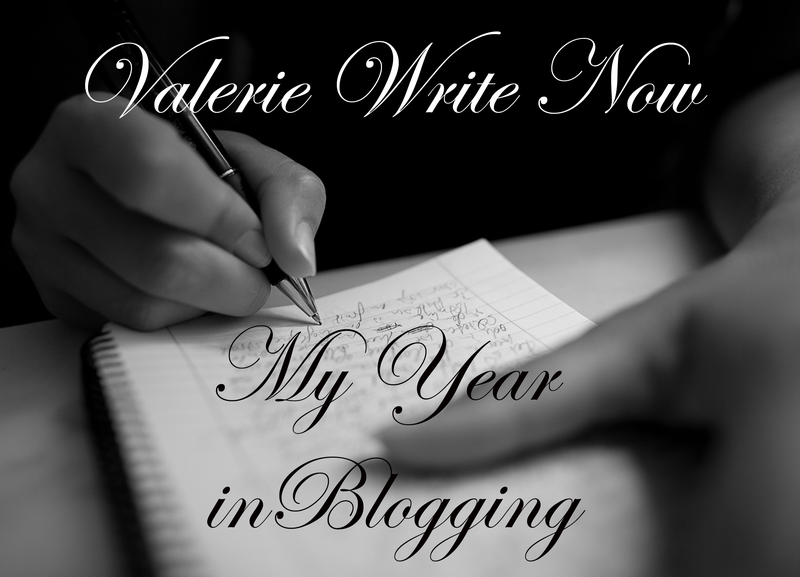 I wrote about them in the series called My Book Bag: Year in Review. My hope for next year is to review each book as I read it. Those posts will all be called “My Book Bag” followed by the book title. I have also tried to consolidate my social media world to save time. I have removed (at least for now) my Valerie Write Now Facebook page and combined it with my personal profile. You can follow me there for blog updates without adding me to your friend list. Just go here if you would like to do so. Or you can subscribe or follow me on other media sites, just check the sidebar. Well, those are the highlights of my year in blogging. A lot happened this year. There were birthdays, recitals, soccer practice, homeschooling, a bit of drama, and myriad blessings from the Father. I must close by saying thank you. This blog wouldn’t be very much without readers. I extend my heartfelt thanks to you for reading, sharing, commenting (Even those who disagree! Thank you for writing me! ), and for just being here at all. May the Lord bless you in the coming year! I have enjoyed reading your posts this past year, and look forward to reading more in 2016. Happy New Year!